The smaller front tower was added later in 1932. Back further and we are now before the tower was reduced in height. The elegant 120ft tower was affected by fog, and so was reduced to the present height of 86ft in 1875. 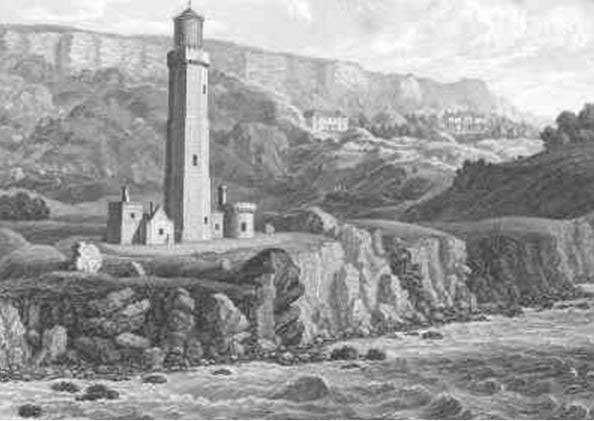 St Catherine's Lighthouse was built as a result of the wreck of the 'Clarendon' in Chale Bay on the 11th October 1836, on rocks near the site of the present lighthouse. Built 1838-40. Designed by Walker and Burgess, it is constructed of ashlar stone with dressed quoins and was carried up from a base plinth as a 3 tier octagon, diminishing by stages 120ft tall, as an be seen in the old black and white illustrations above. The elevation of the light proved to be too high, as the lantern frequently became mist capped. In 1875 it was decided to lower the light from 36.5m (120ft) tall by 13 metres, by taking about 6 metres out of the uppermost section of the tower and about 7 metres out of the middle tier, which destroyed its beauty and made it appear dwarfed. The result was a tower 26m (86ft) in height. The way it looked at that time is shown in the old Photochrome print above. In 1785, 3 designs by R. Jupp were used by Trinity House to place lighthouses at the Needles, St. Catherine's Point and Hurst Point. This suggests there was already a lighthouse at or near this position, but perhaps not effective, as the other two initially proved to not suit their purpose well. It may however be that there is or was a second St Catharine's Point. Technically we now had a Stuccoed octagonal tower of 2 stages. Machicolations and castellated parapet surmounted by conical light and ball finial and weathervane. The way it looked at that time is shown in the old Photochrome print above. At that time the fog signal house was situated near the edge of the cliff but owing to erosion and cliff settlements the building developed such serious cracks that, in 1932, it became necessary to find a new place for the fog signal, which was eventually mounted on a lower tower annexed to the front of the lighthouse tower, and built as a small replica, but with an open arcade on the ground floor. The resultant effect has been to give a well proportioned step down between the two towers which are now expressively referred to by the local inhabitants as "The Cow and the Calf". The fog signal was discontinued in 1987. 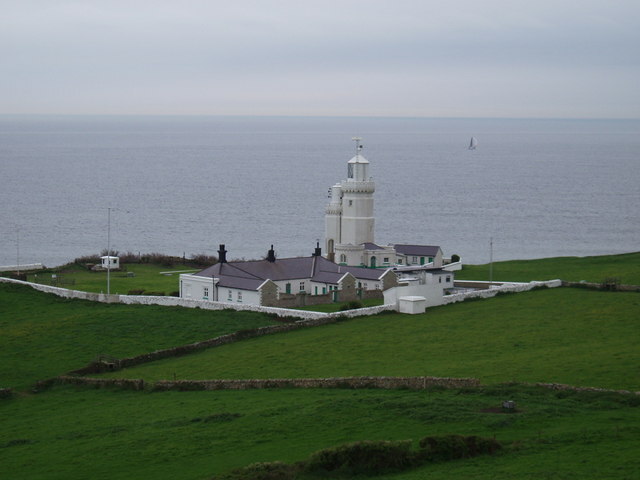 St Catherine’s Lighthouse was automated in 1997 with the keepers leaving the lighthouse on 30 July. The lighthouse itself is now monitored and controlled from the Trinity Housel Centre at Harwich in Essex. 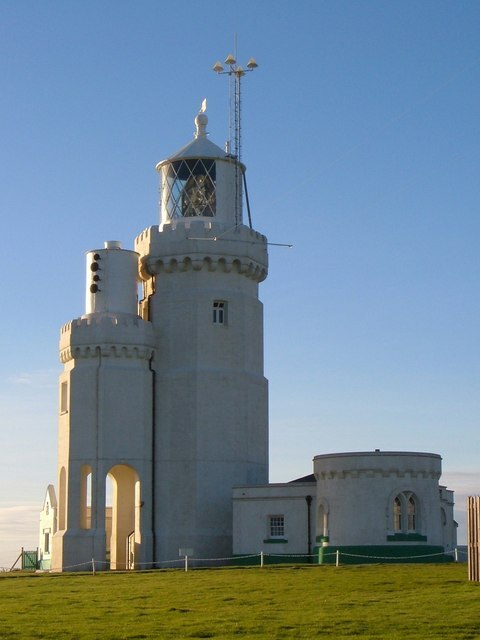 Today the distinctive octagonal tower of St. Catherine's Lighthouse provides a waymark for vessels navigating in the English Channel and a guide to vessels approaching the Solent. 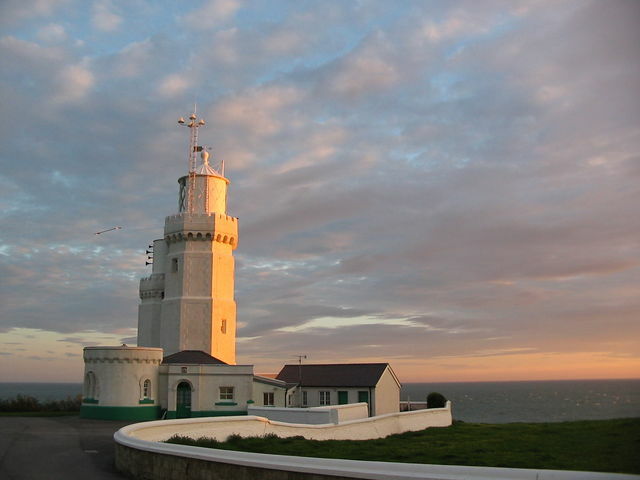 The main light, visible for up to 30 nautical miles in clear weather, is the third most powerful light in the Trinity House Service giving a guide to shipping in the Channel as well as vessels approaching the Solent. In addition to the main light, there is a fixed red subsidiary light displayed from a window 7 metres below the main light and shown westward over the Atherfield Ledge. It is visible for 17 miles in clear weather, and was first exhibited in 1904. Both lights are electric, and standby battery lights are provided in case of a power failure. 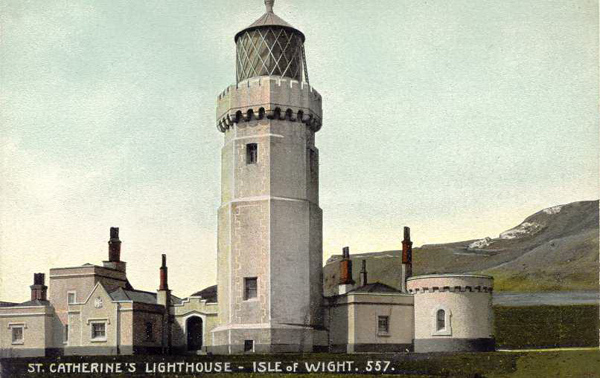 A light to warn shipping was first established on the Southerly tip of the Isle of Wight in 1323. A small light was first set up at St Catherine's in about 1323 by Walter de Godyton. He erected a chapel and added an endowment for a priest to say Masses for his family and to exhibit lights at night to warn ships from approaching too near this dangerous coast, both purposes being fulfilled until about 1530 when the Reformation swept away the endowment. Neither the present lighthouse tower, lighted in March 1840, nor the chapel of which the ruins remain, held these ancient lights. This exists today and can be visited nearby see St Catherine's Oratory. A tragic incident took place at the station during the Second World War. On the 1st June 1943 a bombing raid destroyed the engine house killing the three keepers on duty who had taken shelter in the building. R.T Grenfell, C. Tomkins and W.E Jones were buried in the local cemetery at Niton village and a plaque in remembrance of them is displayed on the ground floor of the main tower. The lighthouse had been a weather reporting station for the Meteorological Office for some years. The keepers made hourly reports which included the temperature, humidity, cloud height and formation and wind direction and force. 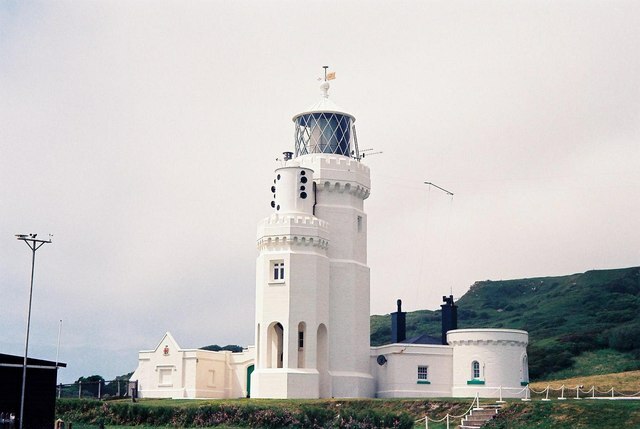 Following demanning of the lighthouse an automatic weather reporting station was installed which sends details of the weather conditions to the Met. Office. This lighthouse is open for visitors, and each tour is approximately 35 minutes, including a trip up the 94 steps up to the lantern. 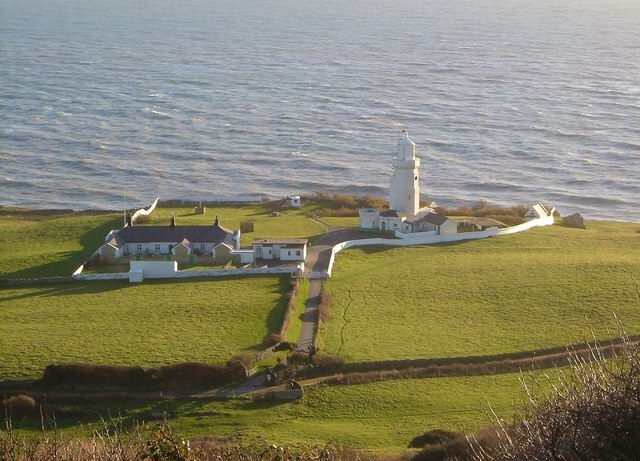 St Catherine's Lighthouse is situated at Niton Undercliffe, 5 miles from Ventnor on the Isle of Wight. See the grids below for more information. 1838, 1932 second smaller tower. 27m (26m/86ft) originally 36.5m (120ft) tall, it was reduced in height in 1875. One White Flash Every 5 Seconds, plus other lighting see text. Site with many facts and small old pictures on part of IOW. St Catherine's is situated at the most southerly point of the Isle of Wight, off the A3055 near Niton. There is no vehicular access to the lighthouse. Best Times to Visit: Check opening and access times. Lighthouse, coastal, wildlife, plants, possibly ships. Shoes suitable for climbing many steps, small bag with necessary items, Camera, selected lenses and filters. Please let us know any other information that we can add to the Further information and Planning Grids or page and any errors that you discover. Before making a long trip to any location it is always wise to double check the current information, websites like magazines may be correct at the time the information is written, but things change and it is of course impossible to double check all entries on a regular basis. If you have any good photographs that you feel would improve the illustration of this page then please let us have copies. In referring to this page it is helpful if you quote both the Page Ref and Topic or Section references from the Grid below. To print the planning grid select it then right click and print the selected area.